St. Louis on the Mississippi river by night. 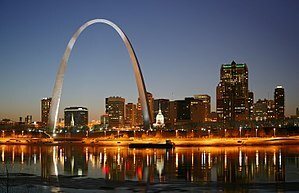 English : St. Louis on the Mississippi river by night. William Hogarth's engraving Gin Lane, as reproduced by Samuel Davenport for his 1807 collection of Hogarth's works. A response to the Gin Craze that hit London in the 18th century, and was blamed for public drunkenness and numerous social problems. 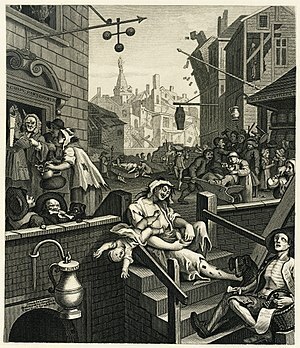 English : William Hogarth's engraving Gin Lane, as reproduced by Samuel Davenport for his 1807 collection of Hogarth's works. A response to the Gin Craze that hit London in the 18th century, and was blamed for public drunkenness and numerous social problems. Horses on Bianditz mountain. Behind them Aiako Harria mountain can be seen. 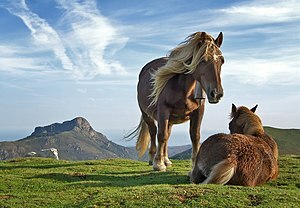 English : Horses on Bianditz mountain. Behind them Aiako Harria mountain can be seen. Ordinary sausage making in Hungary. English : Ordinary sausage making in Hungary. English : View over Paris, at dusk, from the Maine-Montparnasse tower. English : Crepuscular rays, taken at Stow Lake in Golden Gate Park, San Francisco. Stinkhorn (Aseroë rubra) in the camping ground at Springbrook, Queensland. English : Stinkhorn (Aseroë rubra) in the camping ground at Springbrook, Queensland. Dew on a spider's web in the morning. English : Dew on a spider's web in the morning. Female Pholidoptera griseoaptera in the nature reserve Wagenmoos near Udligenswil LU, Switzerland. English : Female Pholidoptera griseoaptera in the nature reserve Wagenmoos near Udligenswil LU, Switzerland. The respiratory system consists of the airways, the lungs, and the respiratory muscles that mediate the movement of air into and out of the body. English : The respiratory system consists of the airways, the lungs, and the respiratory muscles that mediate the movement of air into and out of the body. Ivan the Terrible Showing His Treasury to Jerome Horsey by Alexander Litovchenko. Jerome Horsey was the ambassador of Queen Elizabeth I of Great Britain, and got to know Tsar Ivan IV fairly well during his time there. Behind Ivan can be seen Fyodor, his heir. 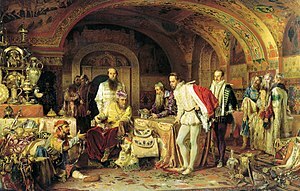 English : Ivan the Terrible Showing His Treasury to Jerome Horsey by Alexander Litovchenko. Jerome Horsey was the ambassador of Queen Elizabeth I of Great Britain, and got to know Tsar Ivan IV fairly well during his time there. Behind Ivan can be seen Fyodor, his heir. A game of snooker (or billiards) in progress. The game is being played on a half-size table. English : A game of snooker (or billiards) in progress. The game is being played on a half-size table. English : Michelangelo's Pietà in St. Peter's Basilica in the Vatican. Sadko in the Underwater Kingdom by Ilya Yefimovich Repin in the State Russian Museum, St. Petersburg. English : Sadko in the Underwater Kingdom by Ilya Yefimovich Repin in the State Russian Museum, St. Petersburg. The [Franco-Prussian] War: Fall of Strasbourg - Departure of French Prisoners, an engraving from the October 15, 1870 issue of The Illustrated London News. The city of Strasbourg was considered one of the best fortified in Europe, but after receiving news of Napoleon III's defeat and capture at the Battle of Sedan, meaning no reinforcements would be coming, the leader of the defensive forces, General Uhrich, was forced to surrender. English : The [Franco-Prussian] War: Fall of Strasbourg - Departure of French Prisoners, an engraving from the October 15, 1870 issue of The Illustrated London News. The city of Strasbourg was considered one of the best fortified in Europe, but after receiving news of Napoleon III's defeat and capture at the Battle of Sedan, meaning no reinforcements would be coming, the leader of the defensive forces, General Uhrich, was forced to surrender. 180-degree panorama of the Italian Dolomites from Plan de Corones, Bozen, Italy. English : 180-degree panorama of the Italian Dolomites from Plan de Corones, Bozen, Italy.